Two weeks ago, firefighter Kendall James Murphy was bound to be wed. A tragic accident in Montgomery, Indiana, however, decided differently. 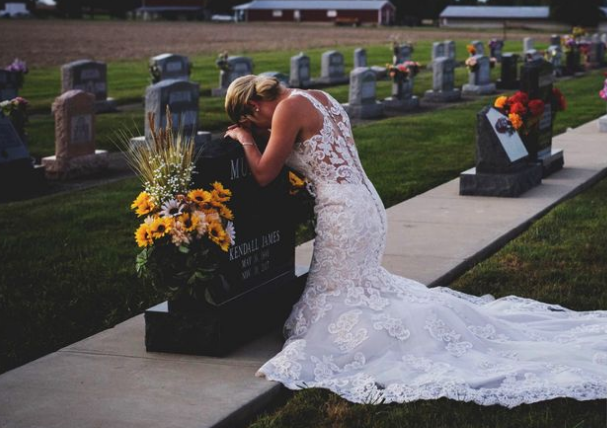 As the ultimate tribute, his fiancé Jessica Padgett organized a moving photo shoot on their promised day of which the pictures have now been published. She put on the wedding dress that she would have worn for him and said goodbye to his gravestone. The heart-breaking resulting picture creates a firm lump in the throat. The accident occurred very, unfortunately, some eleven months ago: Mr. Murphy had responded to a call and was on the spot putting on his fireman's uniform. At that moment, his colleague Colby Blake drove up but lost control of the steering wheel, ramming three cars and crushing Murphy. The 27-year-old victim did not stand a chance and died on the spot. Investigation proved that Mr. Blake, who left the vehicle unharmed, was drunk at the wheel. His process is due to follow. Jessica was left heartbroken but vowed to honor her boyfriend. Brave Jessica Padgett put on her dress and took pictures at his tombstone. She says her wedding day was special, even though she didn't get to marry the 'man of her dreams' after all.